At thirty-eight, Eliza Benedict may appear to be an ordinary wife and mother of two kids. She and her family have just returned from six years in England, and her husband has a good job. They have an expensive house in Bethesda, Maryland. But, Eliza has a past, and Laura Lippman is the author skillful enough to reveal it while leaving you still wondering about it. I'd Know You Anywhere is a riveting, powerful novel of tragedy and suspense. It came as a shock to Eliza to receive a letter from Walter Bowman. He was on death row for the murder of a young teen, but, when Eliza was fifteen and known as Elizabeth Lerner, he had kidnapped her, and held her hostage for six weeks. Why was Elizabeth allowed to live when Bowman had killed at least two girls, and was suspected of killing others? That's the question that has haunted the adult Eliza for years, and, now that Walter is facing execution and writes, she faces a dilemma. Should she write back? She and her husband, Peter, have kept her past a secret from their children. But, someone delivered and wrote that letter for Walter. There's more than one threat to Eliza's peace out there. Why her? Why is Walter writing now? Why did he let her live? Why was Elizabeth the one that got away? Throughout the book, Lippman takes the reader back to 1985, and Elizabeth's experiences when she's on the run with Walter. Elizabeth, who lived for fifteen years with a volatile older sister, quickly learned to read Walter's moods, and she remained calm, fed his ego, and tried not to disturb him. At the same time, she never made a move to get away from him, and it was a traffic stop after a kidnapping and murder that led to his capture and Elizabeth's release. Now, Barbara LaFortuny, a victim of a violent crime herself, has decided to play advocate in Walter's case, pushing Eliza to meet with him. I'd Know You Anywhere is a gripping novel of psychological suspense. While Eliza tried to hide her past from others, a journalist, Barbara, and others were threatening to reveal the secrets she had hidden from her children. What was the motivation for the characters in this book? If it's possible to hate a minor character, I hated Barbara LaFortuny. What was her motivation? Why was she such a meddler in the lives of others? She was motivated by something other than her stand against the death penalty, although she would never acknowledge it. Even Walter's true motivation was hidden until the end of the book. But, Eliza, to paraphrase Lippman, only wanted to live a life that wasn't defined by what happened to her as a teenager. And, she still yearns for the house, and the childhood she lost, because of those six weeks in her life. When asked, "How were you rescued," Lippman had Eliza almost say, "I'm not sure I was." I'd Know You Anywhere is an intense novel that recognizes the dangers in the ordinary world, and the strength it takes to live one day at a time knowing of that danger. 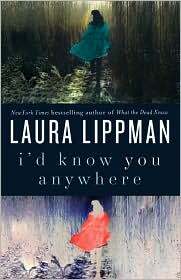 I'd Know You Anywhere by Laura Lippman. HarperCollins, ©2010. ISBN 9780061706554 (hardcover), 384p. FTC Full Disclosure - I'm participating in the TLC Blog Tour for I'd Know You Anywhere, so Lippman's publicist send me an ARC of the book. I saw Laura Lippman on Tavis Smiley's show on PBS, talking about this book. I became fascinated with it then. That Lippman could take such a topic and weave an thoughtful and provocarive book out of it is interesting. And, I want to see how she did it. The death penalty issue is one thing. Lippman is opposed to it morally, as am I. However, the story you bring up of the character who wants to reveal the main character's past and violate her privacy and her coping mechanisms, annoys me. And I haven't even read the book yet. No one has the right to violate a survivor's privacy or need to live her life the way she has to in order to have a life. Anyway, I have no idea when I'll be able to read this, given the enormous TBR pile and list from all of the great blogs online and also given the time spent on reading aforementioned blogs. Loved this book. Lippman plunges you into the book. It's so suspenseful. Quite the pageturner. I seldome recommend that people move a book up on their TBR pile, but, with your fascination with it, I'd move it up if I were you. I'd love your take on this book, and that particular character, after reading it. As you said, Janet, a pageturner. I sailed right through this one since it was hard to put down. Her best yest, IMHO. Stunning. This one line - "I'm not sure I was." - is enough to send chills down my spine. I can't imagine being in Eliza's shoes, but apparently Lippman does a good job putting the reader there. Thanks for being on this tour - I enjoyed reading your thoughts on the book. I'll try to move this book up to the top of the TBR pile. It does fascinate me and yet gives me goose pimples and an eerie feeling, like do I really want to know the deepest feelings of the survivor of such a horrific trauma and violation? I guess my curiosity will win out. Wasn't it wonderful, Kaye? I think you're right. I don't think your reactions are going to be exactly what you think ahead of time when you read this book. Lippman does a terrific job, and your reaction may surprise you. Isn't that a great line? It actually sums up so much of Eliza's life. Fabulous book! Thanks for the tour opportunity! As I told Elizabeth, I don't think you'll have the reactions you expect when reading this book. My anger was actually directed at that other character, not even at Walter. Thanks for the review. I love Laura Lippman's work! The strangest thing happened a few days ago. I'm visiting in the DC area and I was wandering around looking for a drugstore. A very nice woman said she could show me where one was and, since she was going that way, she walked with me and chatted. I managed to find out she's Laura Lippman's sister in law! Small world. That's my brush with greatness for the week. You're so welcome. And, it is a small world isn't it? Now, you've met a very nice woman, and you're connected within six degrees of separation. Much closer in fact. So, are you going to read the book? I'll definitely read it, Lesa. Either in paper or on my e-reader. I hope you come back and let me know what you thought, Kaye. As Kaye Barley said, this one might be her best yet. Great, Kaye. I know it won't be too long until you get a chance to read it. And, once you pick it up, I predict you won't be able to put it down. Laura Lippman's books tend to be that way. You cannot put them down and stay up into the wee hours reading. Her stand-alone "What the Dead Know," is amazing. This one is amazing as well, kathy. Can't wait to hear what you think when it finally makes it to the top of your TBR pile.